So this happened last week. 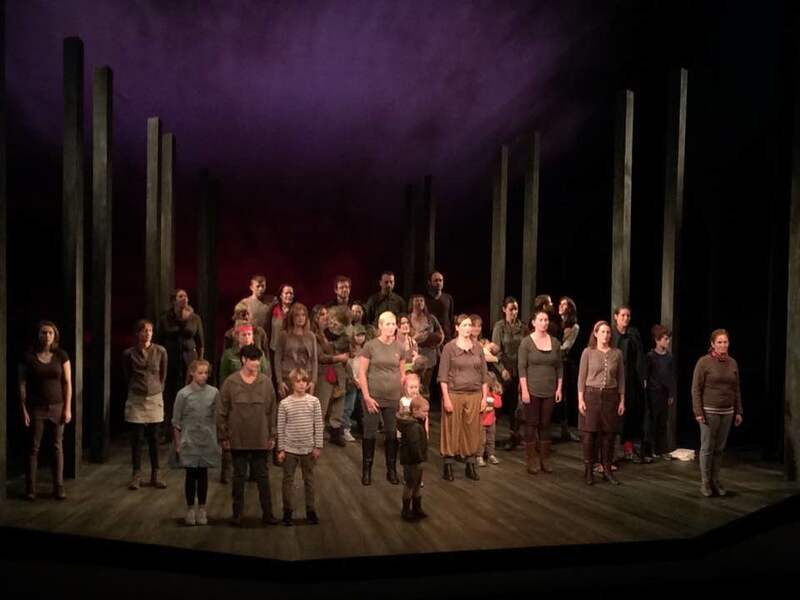 Mothers Artists Makers presented our devised theatre piece in response to the play Observe the Sons of Ulster Marching towards the Somme by Frank McGuinness. Nearly 20 mother/artists on stage exploring the battleground of motherhood. The devising as well as the performing was experimental in that we attempted to do it with our children either involved in the early making of the work or on stage with us. On a personal level, it was the fulfilment of a long held desire to act upon the stage of the Abbey theatre. I’ve tread the boards of many illustrious theatres but the Abbey has been renowned as a bit of closed shop. Being up there kind of broke the mental block I had about the place, infused me with a bit more confidence and reminded me once again how I am never more alive than when I’m acting. It was a great privilege to work along side such a talented team of women and I look forward to what we are going to do next. We’re back with a bang. Today’s episode is the Facebook Live conversation I recorded with Dr. Cara Augustenborg on the 31st of August. I was holding off releasing the podcast because Cara was a finalist in the Littlewood Ireland Blog awards in the Current Affairs category and I kind of had a feeling she might be a winner. My instinct is never wrong! Huge congratulations to Littlewood Ireland Best Current Affairs Blog award winner Cara Augustenborg of The Verdant Yank! 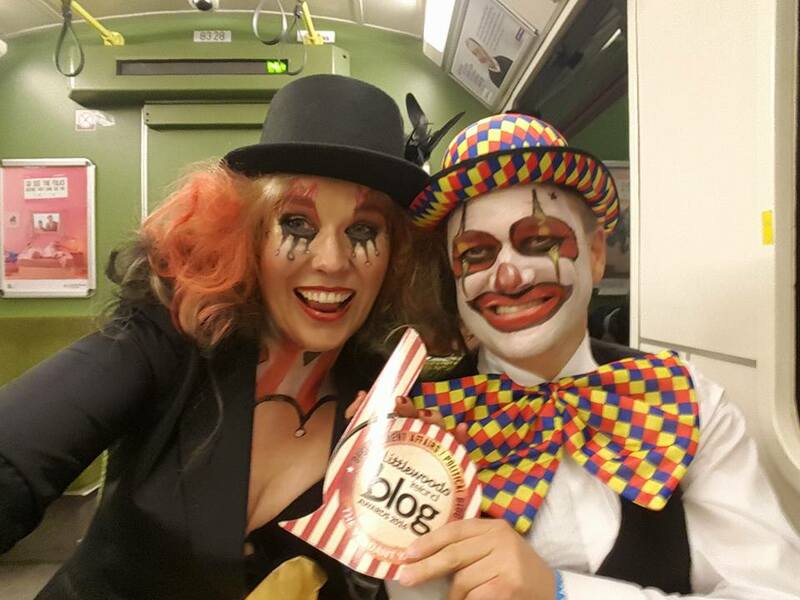 And if you’re wondering about the wild make up on our esteemed winner, the awards ceremony was held at Duffy’s circus and all finalists were encouraged to dress up. If there’s one thing about Cara, she does nothing by halves! Cara is an environmental scientist and communication expert specializing in climate change impacts and solutions. She lectures in ‘Climate Change and the Environment’ at University College Dublin and in Trinity’s Business School on ‘Business and the Natural Environment’. 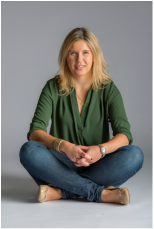 Cara conducted her doctoral research at Teagasc and was the Irish Ambassador for Ben & Jerry’s Climate Change College, traveling to the Arctic with the late Marc Cornelissen in 2008 to witness the impacts of climate change first-hand. She currently serves as Chairperson for Friends of the Earth Ireland and represented the NGO at the Paris Climate Summit last December. We talked about her shift from purely working on the science behind climate change to becoming an activist. While she is able to understand and share the dire reality of climate change, what I liked about our conversation was her hope about the possibilities for a brighter future. She talks about how becoming a mother impacted her commitment to seeing positive change here in Ireland and abroad. Her award winning blog can be found at The Verdant Yank. You can listen the podcast on Sound Cloud or iTunes. There’ll be more great conversations to come in the next few weeks so stay tuned. Don’t forget to subscribe to the podcast on iTunes. You can follow me on Facebook at Melanie Clark Pullen – Strut and Bellow. I tweet sporadically at @StrutandBellow but I thoroughly enjoy posting pics on Instagram. So I didn’t make the finalist stage of the blog awards which I actually feel rather disappointed by, if I’m honest. It was one of those things when making the long list and the short list were utterly unexpected. You get your hopes up, you start to imagine ‘what if’. I’ve been on this merry go round a thousand times over in my life as an actress. In recent years I’ve had to deal with a lot of rejection and disappointment. It does something to you. I’ve developed a thick skin, sure, but I have also found myself holding back a little, steeling myself for the blow. In this, as in line, it can mean I don’t give my best. So when the opportunity to audition for a great role came up recently, I found myself rearing back from the preparation and listening to the cautious voice inside that says ‘don’t get your hopes up’. But a wise friend recently told me how there are often three voices that are in constant dialogue inside us. The Animal says ‘go for it, tear it up, roar’. The Mind says ‘hold on now, take it easy, you’re gonna get hurt’. It’s ok to be disappointed if something does work out. It’s ok to say you’re gutted. Tell you what, if I don’t get this gig, I might be drowning my sorrow in some vanilla ice cream for a while. But my Soul knows that, no matter what nothing really changes. She is enough. I did the audition. Soul let the Tiger have a good ol’ roar. And now she’s curled up purring contentedly while Mind is recovering by lying down in a dark room. And so we wait and hope, wait and hope.